By the time Friday rolls around, I am done in the kitchen. 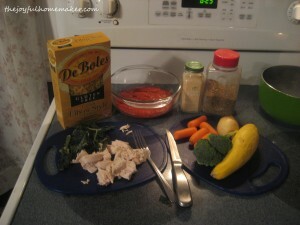 I need a quick, healthy meal to put on my menu plan that everyone enjoys. This week I knew we were having chicken, so we had plenty of leftovers after today’s chicken salad wrap (I will post tomorrow). My mom hit a good sale at Village Market and brought me a bunch of mark down summer squash, so naturally I wanted to use them up. I have made Chicken Garden Goulash for years now, and it never fails to please. Below is my recipe for this healthy, one-pot meal. I make it using gluten-free pasta; however, it can be made using whole wheat, or any other form of pasta. Though we don’t typically eat corn pasta, I do prefer it for this recipe. I find brown rice pasta doesn’t hold up as well. It can also be made using rice. You can use any veggie of choice in this dish, I often use zucchini and I typically throw in some broccoli; however, the baby doesn’t tolerate broccoli. Jack had a bit of raw broccoli with his dinner. Boil water, toss in pasta and cook according to directions. Toss olive oil, garlic powder, and chopped onion into pan. Cook until soft. 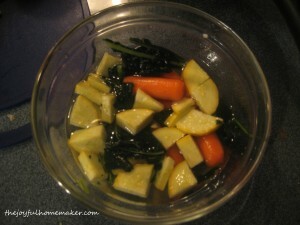 Put carrots, squash, and kale in a steamer, or microwave, and cook until soft. 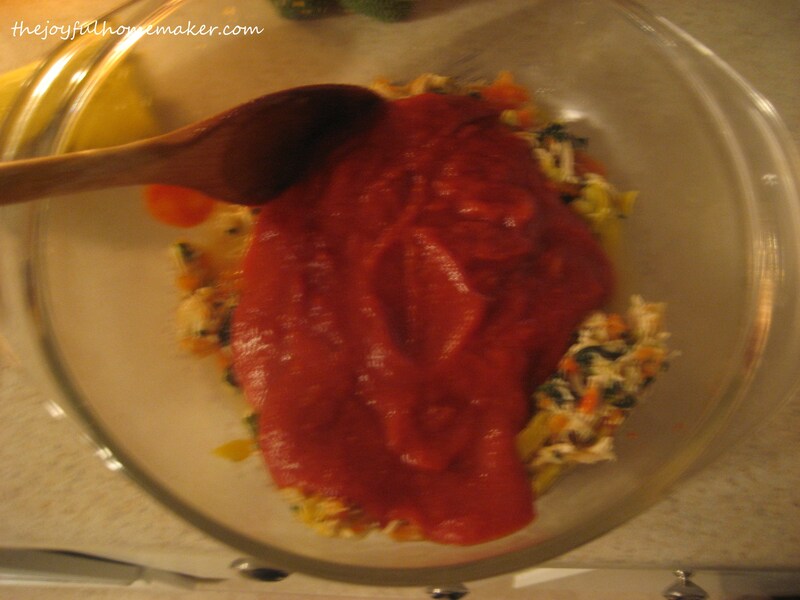 Heat pasta sauce until hot. Add Italian seasoning if needed. 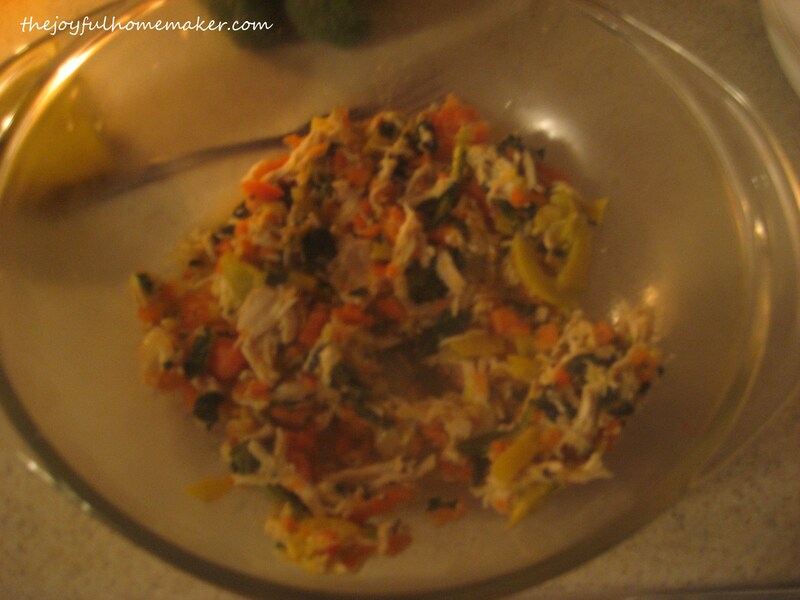 Remove veggies from steam and toss into Vitamix or blender with chicken and onions for a quick chop. Remove pasta from stove. 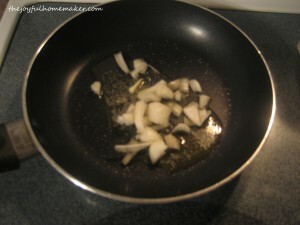 Drain, and put back into pan. 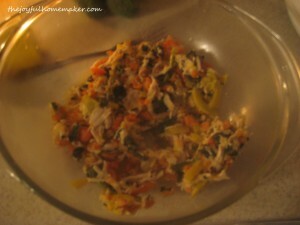 Add veggie and chicken mix to pasta. 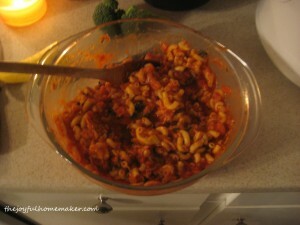 Add hot pasta sauce and stir.